Young female in the Alana Gully with shrapnel in her wrist from Iranian shelling. June, 2016. Photo by: Julie Brown. Decades of bombing along the borders of Iraqi Kurdistan and its neighboring countries of Turkey and Iran has created an ongoing human rights and humanitarian crisis for the village population and migrant families inhabiting these regions. Accounts from civilians and members of local municipalities paint a stark picture of the ongoing effects these conflicts are having on the local population. The following is a sampling of reports taken by CPT from 2015 to 2017 outlining the current state of impacted villages and seasonal settlements along Iraqi Kurdistan’s borders with Turkey and Iran. Based on the following findings we would call on the governments of Turkey, Iran, Iraq and Iraqi Kurdistan as well as armed resistance groups to ensure protection of civilian lives and property, and to engage in diplomatic peace talks resulting in an immediate ceasefire. We also ask foreign governments and institutions to withdraw support from these conflicts along the borders and use diplomatic means to help bring an end to this protracted war. In addition, by amplifying the voices of villagers living in these border regions CPT aims to raise awareness and encourage action of the international community. Iraqi Kurdistan (IK) is an autonomous region located in the north of Iraq. The region has its own President, Parliament, judicial system, security, and military structures. Iraqi Kurdistan borders Turkey to the north, Iran to the east and Syria to the west. These borders are defined by international treaties. The southern border between Iraqi Kurdistan and the rest of Iraq is not clearly defined and shifts depending on current political climates of the two governments. The rugged Zagros mountain range forms the borderlands between Iraqi Kurdistan, Turkey and Iran. For millennia Kurdish peoples have inhabited these rising mountains and fertile valleys sustaining their livelihoods by farming, grazing animals, local trade and crafts. Due to their historically strategic importance, many armies and armed resistance groups have used these mountains for battle operations and protection as well as fought for control over this region. The main actors of the current cross-border conflicts are the Armed Forces of Turkey, the Islamic Republic of Iran and several armed groups within Iraqi Kurdistan. These groups took up arms in what they say is a struggle for self-determination against political and socio-cultural marginalization and oppression of Kurdish people in Turkey and Iran. The armed group and political movement with the strongest influence as well as largest area of control in the region is the Kurdistan Worker's Party (PKK). This group began fighting against the Turkish state in the 1980’s after a military coup in Turkey. In the early 1990's the PKK moved many of its fighters, camps and bases to Iraqi Kurdistan. Other armed groups that have been using this mountainous region for their operations against Iranian state’s forces are: Kurdistan Free Life Party (PJAK), Society of Revolutionary Toilers (Komala), Kurdistan Free Party (PAK) and Kurdistan Democratic Party-Iran (PDK-I). Hundreds of villages and small towns dot the Zagros mountains and valleys along the Iraqi Kurdistan borders. In addition, thousands of migrant shepherd and farmer families use the region between the months of March and October to farm, raise flocks and sell produce. Turkish and Iranian forces frequently use fighter jets, helicopters and artillery to bomb and shell hideouts of armed groups also living within these mountains. An official of the Turkish consulate in Erbil, IK told CPT in 2017 that past attacks against Turkish military forces motivate Turkey to continue its bombing campaigns. The PKK asserts that, the Turkish government has denied the Kurdish people their rights in Turkey and they will not lay down arms until their inherent rights are recognized and respected. As a result of the constant aerial bombardment and shelling, the civilian population of the Zagros Mountains is deeply impacted. Villagers, and migrant communities, for whom this region has been a lifeline of their livelihood and culture for centuries, have suffered for over three decades. Throughout the war the PKK announced a number of unilateral ceasefires. The Iranian front has seen its ebbs and flows of violence. The latest ceasefire began in March 2013 and took form of peace negotiations between the Turkish government and the PKK. Displaced persons returned to their villages and started farming, raising their herds and rebuilding their homes. During this period, the area flourished. In July 2015 the ceasefire between PKK and Turkey broke and at the same time Iran and other armed groups reengaged in military actions. Renewed bombing has resulted in damage to civilian homes and structures, lost livestock, burned fields, civilian casualties and civilian deaths. The Turkish and Iranian governments assert that they have not targeted civilians during their bombing campaigns against the PKK and other armed groups in the borderlands of Iraqi Kurdistan. However, the most severe effects experienced by people in the conflict regions are death and serious injury. On August 1st, 2015 the village of Zargali, located in the Qandil area, was targeted by Turkish bombing which resulted in eight deaths and many serious injuries. The attack started in the early morning as Turkish warplanes fired rockets into Zargali village destroying houses, killing an elderly woman, and injuring her husband and three relatives. After people from the surrounding area and other villages came to assist the wounded, warplanes returned firing rockets on to the rescuers killing seven and injuring eight more. The attack on Zargali, referred to as the Zargali massacre by locals, is just one example of the dangerous reality that civilians face. In July, 2017, a Turkish bomb targeted a vehicle of people going for a picnic in Zakho District and injured four people. CPT has documented many injuries to civilians including Iranian shelling wounding children in the Alana gully of Choman district in June, 2016. The attack from Iran on the Alana gully lasted hours as many shells hit open spaces where families of migrant farmers lived and worked. Several children tending sheep took shelter behind stones as shells landed in the fields. By the end of the attack, three children had sustained injuries including one young female with a piece of shrapnel lodged in her wrist. Furthermore, unexploded munitions left after Turkish and Iranian bombings pose a major threat to civilians. In the village of Barbzin in Sidekan district, a local farmer attempted to show CPT an unexploded Iranian shell but upon our arrival we found that it had discharged. The surrounding field was littered with shrapnel in an area where many migrant farmers work daily. The mayors of Qandil district also report huge numbers of unexploded bombs from Turkey lying in fields in addition to one lodged in a home in Endza. During times of active bombings and shellings multiple villages are often displaced. This displacement can last anywhere from a few days to decades. The displacement has been so vast and ongoing that in many districts there are no accurate comprehensive governmental records. This lack of written documentation leaves a majority of details slow to emerge and left to oral history from villagers. Many villagers have evacuated their original lands and built new villages nearby. Often the new sites are bombed and the village must move again. Shahe in the Akre district as well as Sargali in the Amedi district have both been in three separate locations due to Turkish bombings targeting the PKK. Shahe once contained fifteen families but now contains five with a majority of people only returning for the planting season. The sub-mayor of Dinarte informed CPT in August 2017 that twenty villages in Dinarte are currently completely displaced with their inhabitants relocated to the cities of the district. He also stated that villagers are “petrified to visit their fields.” This displacement, either partial or total, is the reality for hundreds of villages throughout Iraqi Kurdistan. For people still in their homes the situation is often severe. Concussions from the bombings easily collapse houses, crack cement walls and shatter windows. When Turkey bombed Zargali in August 2015, seven homes were completely demolished. An additional 33 families reported damage to their homes and shops. In May 2016 Turkish airstrikes targeted the village of Dupre in the Akre district leaving many windows blown out of houses, holes in roofs and the water tanks of the school destroyed. People took refuge in their homes as the attack happened at night and tried to stay away from windows. Villagers counted 56 explosions in the single bombing event causing damage to thirteen homes and the village mosque. CPT has documented numerous cases where whole villages claim that all of their windows were blown out as well as many structures damaged or destroyed. Residents of Dupre reported that a local TV station, NRT, contacted the Turkish Consulate to notify them that civilians had been bombed but that Turkey denied the accusations. The Turkish Consulate located in Erbil stated during a meeting with CPT in May 2017 that attacks against the PKK are happening far away from villages. This statement contradicts current CPT findings. Villager from Barbzin village showing CPT remnants of an Iranian bomb that burnt his field. June, 2016. Many bombings occur during the dry months and target rural areas. These lands support whole communities as well as are seasonal places of residence for migrant farmers. Heat from the blasts creates massive fires that burn whole swaths of farmland destroying crops, orchards, beehives, wild grasses and local wildlife. A governmental report provided by the sub-mayor of Dinarte outlined damages to the sub-district in 2015. It stated that in the village of Shahe alone, over 500 sumac trees, all over sixteen years in age, were lost due to Turkish bombing. An estimated total value of land damages in the village of Shahe alone was over six million Iraqi Dinars. The Dinarte report lists over 350 million Iraqi Dinars of agricultural losses from lands of 135 property owners living in twelve villages. Many families have seen their crops burn in consecutive years. This generates a burden on the livelihoods of migrant agricultural workers as well as the villages which use the harvests to sustain their food needs. Herds are killed or lost during bombardments which leads to situations such as one in the village of Markajia in Amedi district where they can no longer raise animals. A large number of migrant farmers rent land near the borders on a seasonal basis for herding and agriculture. Farmers have reported having to flee with their families leaving everything behind and losing the income from the herds and agriculture along with the investment for rent. For many families, farming this land is their only yearly income. Loss of access to fertile herding and agricultural lands has burdened the nearby larger towns whose populations rely on the local harvests. In the Amedi and Akre districts many villagers have been completely cut off from visiting their lands due to the bombings or presence of armed groups. In a small number of cases villagers claim to be given a fifteen day permit to harvest sumac but face bombings outside of this short allotted time. In several evacuated villages such as Barbzin in Sidakan farmers have returned only to plant and harvest. In the latter situation, farmers say that they are under constant threat of bombings but can not support their families without the agricultural income. Villagers interviewed by CPT believe that the targeting of lands, especially before harvest, is deliberate as a form of collective punishment from Turkey and Iran against the villagers living within the conflict zone. In all cases of cross-border bombing that CPT has documented there has been a noticeable and severe traumatic impact on civilians. The most stark being the effects on the families that have sustained casualties as well as children who have been through active bombings. Warplanes, surveillance drones and the close proximity of villages to Turkish and Iranian military bases, from which attacks have been launched, has left many people unable to lead lives without fear of future attacks. A woman in Shora in Akre district described in great detail the events of the July 2017 Iranian shelling and its impact on her family. The shelling started at night and she claimed she was “out of her soul” as she fled with her children. She told CPT that now even when she sleeps she is terrified. These types of stories have been reported in 100% of the villages surveyed by CPT. Children in many cases are afraid to go to school as was the case of the bombing in Dupre in 2016 where students missed their final exams. A doctor in the Qandil area reported in August 2017 that villagers are often afraid to seek medical attention after bombings for fear that their family will be bombed in their homes while they are away. Children in many villages have trouble sleeping and are worried about bombings at night. Villagers report that not knowing when the next attack will occur has resulted in high levels of anxiety. Numerous villagers have told CPT that even small sounds make them jump or think they are about to be bombed again. 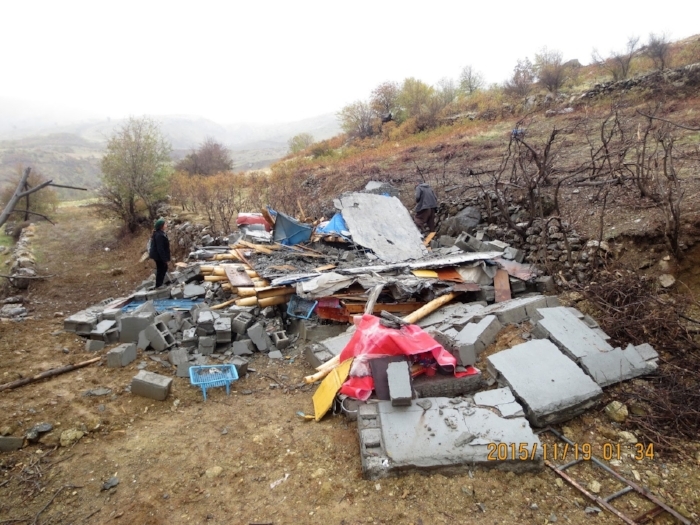 Home destroyed by Turkish bombardments in the Qandil region. 2015. Infrastructure has been greatly damaged due to shellings and aerial bombings. Along with homes and schools, also roads, water projects and electrical projects are destroyed. This has left a strain on residents to have access to basic needs. Because of the high level of threat, the government has not reinvested in the damaged villages and many lack basic necessities. In the case of Baste village in Qandil, an electrical project that would provide main power to several villages was stalled for a decade. The project was first stopped due to active bombardment from Turkey. Later it was also impacted by the financial crisis leaving very few funds to complete the power project years after it had been started. The mayors of Qandil reported to CPT that their electric projects have been targeted by Turkish bombings three times in the first half of 2017 alone. The mayor of Akre stated in August 2017 that his municipality can not repair roads to the villages due to the dangers of bombings. No reliable system to assist in times of crisis and active bombing, as well as no plans to help resettle displaced persons, exists for victims of cross-border attacks in Iraqi Kurdistan. The current war with IS (Islamic State), the economic crisis in Iraqi Kurdistan, the length of the cross-border conflicts, and the lack of international awareness all contribute to an absence of support programs. The residents of Gwndajor told CPT that when they were displaced in 2016 there was no adequate system to assist them. They claim that only some families received a small amount of aid consisting of three blankets and a box of food. Displaced villagers caught in the cross-border conflict do not qualify for international aid programs as most are currently only supporting people affected by the war with IS in Iraq. Multiple municipalities have reported not having funds to assist with the displacement due to the financial crisis and limited budgets as well as a lack of involvement from the international community. Both Turkey and Iran have repeatedly asserted their rights to defend themselves against Kurdish rebel groups indigenous to their respective countries and claim that their state-sponsored attacks have been limited to military targets. The validity of such claims must be examined in relationship to the obligations of countries under international law and the nature of the military interventions inside Iraq. This review concludes that both countries have, in these incursions, violated international human rights laws and agreements. As signatories to international human rights treaties and the Geneva Conventions, both countries have the obligation to ensure that in their military interventions, civilians are adequately distinguished and protected. According to Geneva Conventions of 12 August 1942, and the Protection of Victims of International Armed Conflicts, the combat forces should make a clear distinction between civilians and military or armed forces. Article 51 (2) of protocol 1 prohibits civilians being the object of attack or acts or threats of violence, spreading terror among civilians, the attack of objects dedicated to civilian purposes, such as places of worship, dwellings, hospitals, clinics, and schools. Article 54, prohibits any combat forces from attacking or destroying things needed for the survival of the civilian population, such as foodstuffs, agricultural areas used for food production, livestock, crops, drinking water installations and supplies, and irrigation works, in order to deny the population sustenance or to cause them to move away for any other motive. Furthermore, Article 57 obligates those conducting military operations to take all feasible efforts to avoid the incidental loss of civilian life, injury to civilians and damage to civilian objects, and to refrain from launching any attack that is expected to do so. In the case of Turkey and Iran, CPT findings illustrate that they have not made a clear distinction between military and nonmilitary people. The Turkish and Iranian governments often report about their bombing campaigns focusing on military casualties and seldomly report civilian losses or damages sustained to the villages located in the borderlands of Iraqi Kurdistan. The Turkish government is also obligated to European Conventions on Human Rights (ECHR) and following Articles 2, 3, 8, 13, and ECHR Article 1 of Protocol 1, to protect the rights of individuals to: life, freedom from torture and inhuman and degrading treatment, respect of their family and private life including their homes, and to find an effective remedy for the violation of these rights. Moreover, according to the UN Charter Article 2.4: All Members shall refrain in their international relations from the threat or use of force against the territorial integrity or political independence of any state, or in any other manner inconsistent with the Purposes of the United Nations and Chapter VI, Article 33: 1. The parties to any dispute, the continuance of which is likely to endanger the maintenance of international peace and security, shall, first of all, seek a solution by negotiation, enquiry, mediation, conciliation, arbitration, judicial settlement, resort to regional agencies or arrangements, or other peaceful means of their own choice. This CPT report indicates that both the Iranian and the Turkish governments have clearly violated all the above mentioned international standard laws. Both governments have failed to comply to international treaties in regards to civilian lives and properties. Furthermore, we have found that both countries’ military operations have targeted villages and villagers leading to casualties, destruction of civilian property and livelihoods and mass displacement. As evident by this generation-long conflict, current military tactics are not an effective way to bring sustainable peace to the region. Civilians caught within these cross-border conflicts have sustained heavy casualties, deaths of their relatives, damages to property, loss of livelihoods as well as lasting traumatic effects. The targeting of villages and farmland is in violation of international laws and incompatible with healthy lives for civilians in the border areas. In addition, agricultural losses create a burden on the already crippled financial sector of the region affecting all Iraqi Kurdistan. We find that there is an immediate and urgent need for diplomatic peace talks between all involved parties in these conflicts. Furthermore, we urge the international community including countries with diplomatic ties to involved parties to help foster a climate where these talks can take place. CPT would also encourage other governmental and non-governmental organizations to assess the impacts on the local villagers in these border areas with a goal of providing immediate assistance to the affected civilians.